Rising S uses only the highest quality materials in all of our products and air filtration is no exception. We use a combination of HEPA & ULPA filters surrounded by military grade activated TEDA carbon. TEDA (triethylene di-amine) carbon filter media has a high affinity for the adsorption, chelation and retention of the various species of Iodine. This is the ONLY form of activated carbon that the US military uses in their NBC filters and masks. ASZM-TEDA is Calgon Carbon’s military-use impregnated carbon. It was designed to be a chrome-free replacement of ASC carbon used by the military beginning in WWII. It is also used in the Industrial environment for first responder masks designed to protect against cyanide, cyanogens chloride (CK), and a variety of other harmful gases. This versatile carbon is designed to protect against many of the chemical weapons the government lists as potential homeland threats. 10. Reduced breathing resistance and improved comfort. 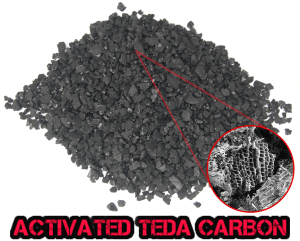 Activated Carbon is a form of carbon (derived for charcoal) that is processed to have small, low-volume pores that increases the surface area available for adsorption or chemical reactions. 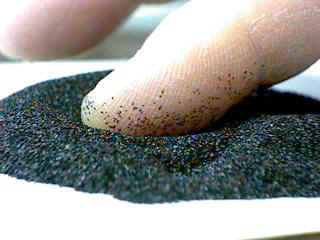 Due to its high degree of microporosity, a single gram of activated carbon has a surface area that exceeds 500 m2, as determined by adsorption isotherms of carbon dioxide gas at room temperature. An activation level sufficient for useful application may be attained solely from high surface area; however, further chemical treatment often enhances adsorption properties.